Today's home, by Aleksandr Zhydkov, is a modern, trendy and cutting-edge home that proves just how magnificent a prefabricated home can be. Some people hold negative connotations when it comes to prefab homes, perhaps thinking they are cheap or of less quality compared to traditional bricks and mortar homes. Today at homify, we are going to show you that this is not the case. Not only is a prefab home quicker to construct, cheaper to build and far more versatile, but it can also be designed exactly according to your specs, moved around easily and take on qualities that leave any architect tingling in their fingers and toes. Let's go and find out just how fab a prefab home can be! Can you tell that this is a prefabricated home? It has been designed in a modern and minimalist rectangle shape, where the designers have opted for a grey facade, wood and glass—very neutral and earthy tones and materials. The glass creates a transparent barrier between the interior and the exterior. This is a great tip if you have fantastic views and beautiful surrounds, as you give those inside the home permanent access to them. It also ensures that natural light soaks up the home constantly. You'll also notice that a large plot has been chosen for the prefab home, where great effort has been made to create a lovely landscaped garden. Luscious grass, pretty flowers and pruned plants complement the entire look and feel of the home. From this angle of the house, we can see that wooden slats work as a facade, offering the family some privacy. If you opt for a home that utilises glass materials, ensure that there is some privacy—you don't want the whole world to be able to see into your bedroom! 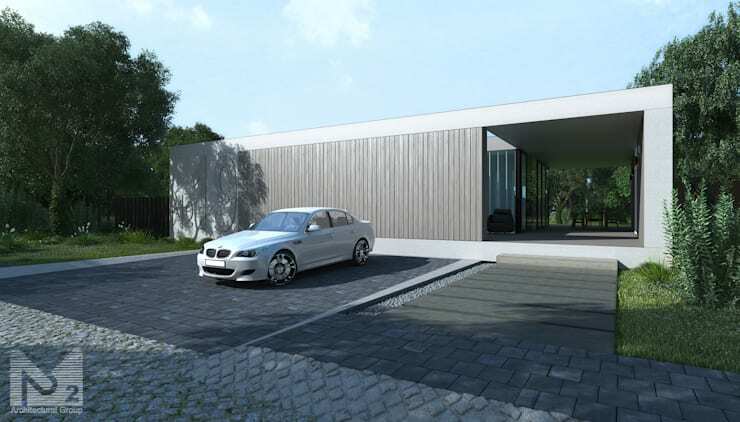 The designers have also created a large grey stone driveway and parking area—plenty of space for the whole family to park their cars, bicycles and scooters. Grey is a great colour for a driveway as it disguises any tire marks or stains. If we move inside the home, into the living room, we can see that the designers have opted for a very neutral, cool and calm interior. The walls are white, along with the lamps and curtains. The designers have introduced several shades of grey with lighter, grey sofas and darker grey cushions and a plush rug! Tip: Add throws, like these ones, to your sofa. Not only do they make the sofa look a little bit more cosy and inviting, but they are functional too. Curl up under one while reading your favourite book or snuggling with your loved ones. 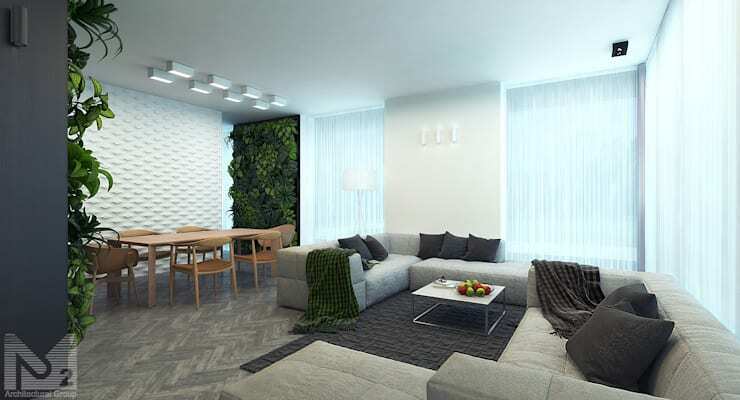 The focal point of this room, however, are the vertical gardens. They breathe new life into this space and add an emerald green hue to the room. Vertical gardens are great additions to any room in the home and are a form of natural decor. If you don't have the time to create one, opt for a lovely, large pot plant or a big vase of flowers. Also have a look at these: Tips to create a very cosy living room. The media room is one of our favourite rooms in the home, with it's cushy sofas that extend around the perimetre of the room, its plush rug, plump cushions and of course, the large flat screen television. If you already have a living room in your home, you may wonder what the point of a space like this is. 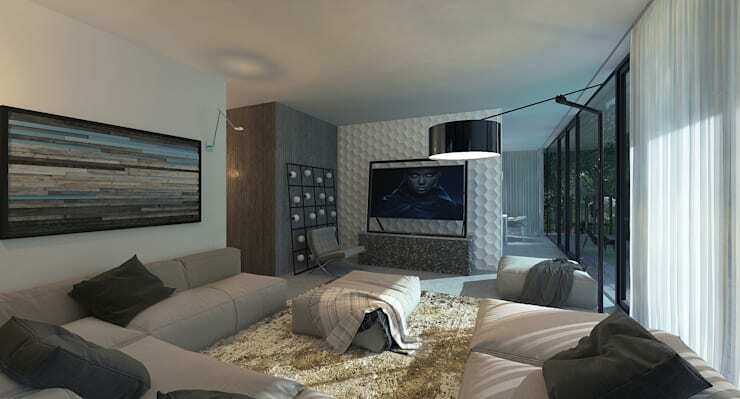 The living room can be used for entertaining, afternoon teas and evening coffees, but the media room is where you can kick back and truly engage in your favourite film with surround sound. And you can get creative with the decorating! Don't you love this gorgeous piece of artwork that hangs above the sofa, creating a very trendy look and feel? Style your media room exactly to your liking, creating an entertainment haven for the whole family. Have a look through the homify media room products for inspiration! The dining room of the prefab home is very low-key and subtle. The furniture is sleek and minimalist, finished in a light wood. 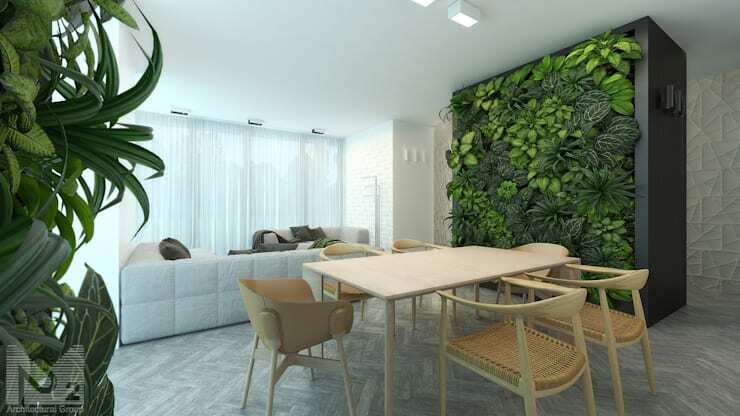 This works perfectly with the vertical gardens used throughout the living space—light and natural. We can also see how the natural light filters into this space, thanks to the large glass windows and doors encasing the home. However, the light white curtains allow the family to control this light, creating a cooler and more shaded space if need be. This home is comfortable, functional, modern and trendy, even if it isn't a traditional bricks and mortar home. Flawless and fabulous! Have a look at these: Tips before buying a prefab home. 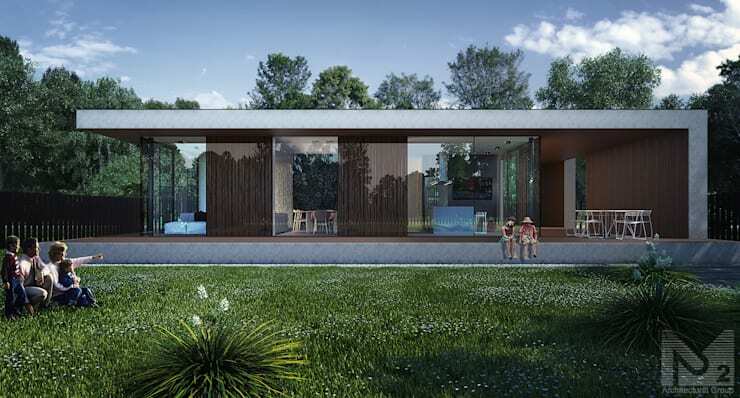 Would you live in a prefab home?